The LuEsther T. Mertz Library will like to share the newest titles to our circulating children’s collection. The featured titles below are extraordinary examples of community efforts and what can truly be accomplished when we work together. Communities can take shape in a variety of ways so whatever your community looks like and wherever it is located, these titles will surely inspire you to build upon the strengths of your friends and neighbors to help make a difference in your community. From our community to yours, we hope you enjoy these titles the next time you visit us in the library! 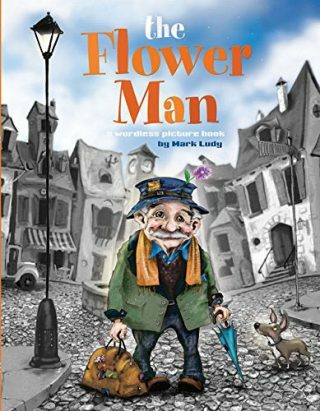 The Flower Man is a wordless picture book that invites readers to follow a small elderly man as he travels from town to town bringing color and happiness to everyone he encounters. A simple garden or a single flower can bring joy to all; The Flower Man does just that! Author Mark Ludy is sending a clear message: investing in the beautification of your neighborhood with color, flowers and greenery will directly benefit the residence and visitors, leading to a friendlier and healthier environment. As each page begins to fill with color readers may find a smile is hard to contain. Ludy’s intentional use of color is meant to elicit emotion and it is certainly successful! From monochrome to a full color palette readers will experience a transformation like no other. Look carefully as you turn each page as the intricate details of the town should not be overlooked. The neighborhood pictured is home to many nameless characters that offer themselves to the imagination of an observant reader. The Flower Man was an instant favorite amongst the LuEsther T. Mertz Library staff and I believe it will continue to be for many years to come. We’re inviting all readers of all reading levels to experience the colorful world of The Flower Man! This title is available for check out for library cardholders. Hope to see you in the library! In Margarito’s Forest, author Andy Carter pays homage to the late Don Margarito of Saq’Ja Guatemala who harnessed his passion for trees and ecology to develop a forest of his own. 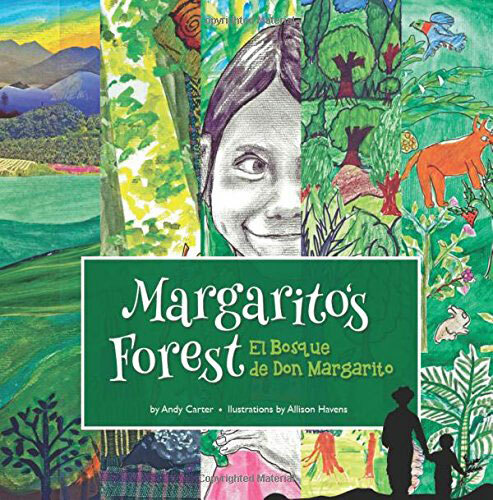 Don Margarito’s story is told in both English and in Spanish from the perspective of a young boy learning the story from his grandmother, Don Margarito’s daughter Dona Maria Guadalupe. Dona Guadalupe passes down the knowledge of the Maya traditions and practices to her children, grandchildren and local children of Saq’ja to continue Don Margarito’s forest and his teachings. This heartfelt story of family, tradition and environmental conservation is perfectly paired with collages made up from original illustrations by Allison Havens and hand drawn pictures from Saq’ja elementary school children. Reading Margarito’s Forest offers an intimate and welcoming perspective into this environmentally friendly community. It’s easy to read Maragarito’s Forest and find inspiration to cultivate your own forest. It’s soup day in the school yard and Kioni is nowhere to be found. While members from the community are picking vegetables, stirring broth and prepping the soup, Kioni is looking for her goats! Worried she won’t be able to help with the community soup, Kioni rushes around in search of her heard. When she finds them they are in the garden, she does her best to lure them out. When the goats refuse to move, her friends decide they too would be able to help make the soup! 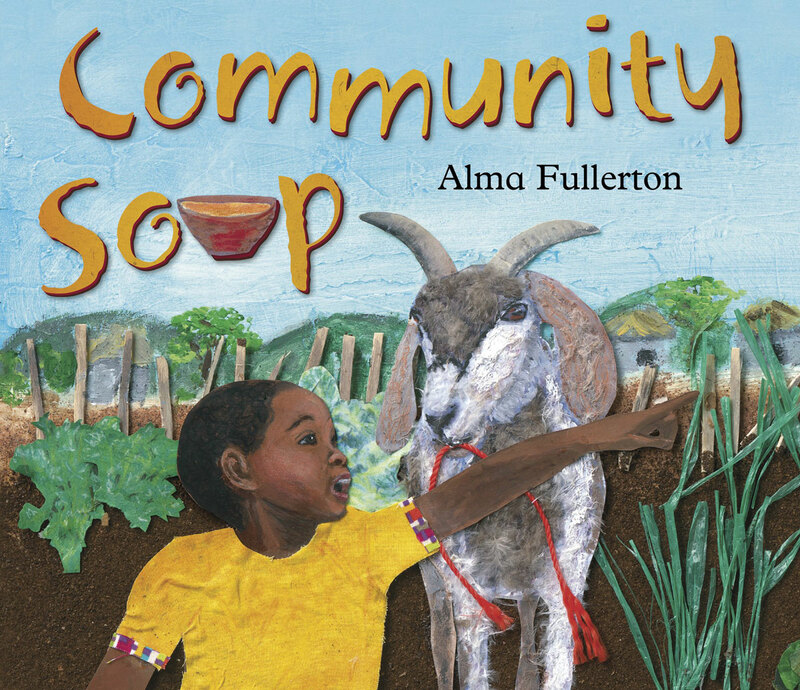 Community Soup is a short fun tale that welcomes everyone, including goats to join in making the community soup! You too can join in by following the Pumpkin Soup Recipe at the very end of the book. Alma Fullerton uses bright colors and texture in excitingly visual collages throughout the book. Each page comes alive and pops right off the page! 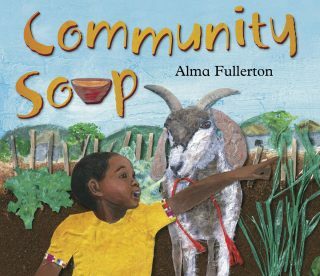 Community Soup is wonderful for young readers looking to explore their culinary side with a little help from Kioni and her friends! 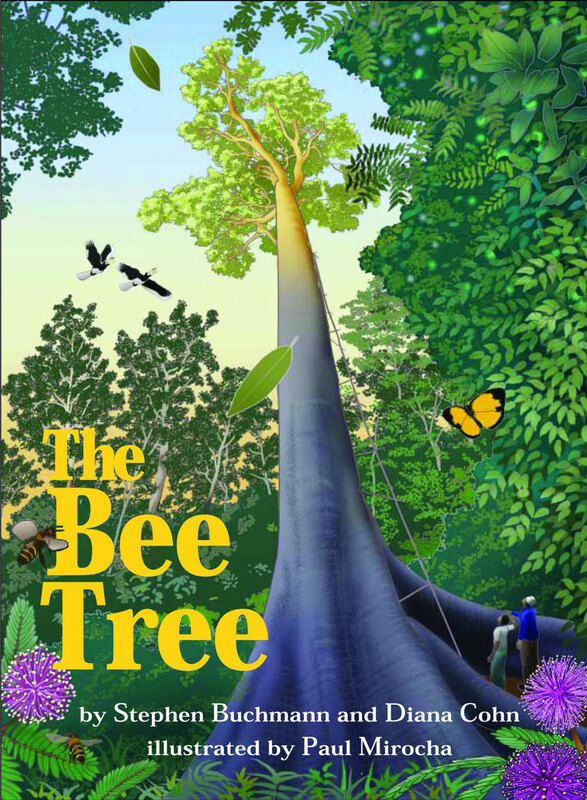 The Bee Tree tells the remarkable story of the Orang Asli indigenous people in Malaysia who are known for their skilled honey hunting. The honey hunt is thrilling as it involves focus, courage and skillful team efforts. The honey hunters climb enormously tall tualang trees at night using limited tools made from wood and rope. The Bree Tree invites readers to join young Nizam on a honey hunt with his grandfather as they learn the traditions and tales surrounding the culture of honey. Towards the end of the book there is information about Malaysia, it’s people and ecology. This tale will certainly inspire appreciation for bees, their honey and those who gather it for us to enjoy. 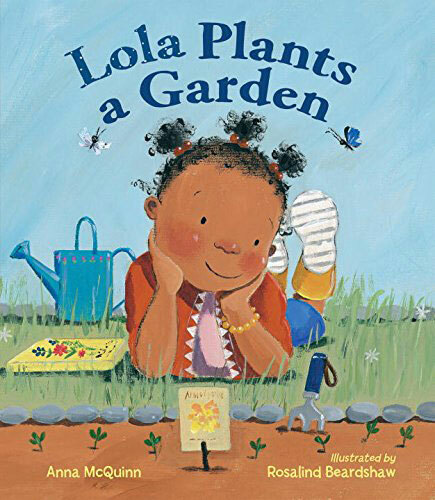 “Mary, Mary quite contrary, how does your garden grow?” The classic poem about Mary and her garden inspired the title character, Lola to plant her very own garden. Planting a garden is hard work. Lola and her mother must first visit the library to research their favorite plants and make a list for purchasing seeds at the store. Once the seeds are planted deep into the ground, Lola must wait but as she waits she begins other tasks. Lola crafts decorations such as bells and shells to be featured in her garden. Of course, she makes a doll, named Mary who after all was the inspiration of it all. As the flowers grow big and open up towards the bright sun, Lola and her father begin to add her decorations. When everything is ready, Lola invites her friends to her garden to enjoy the fruits, the vegetables, the scenery and the poem about Mary. Much like Mary was, Lola and her garden is the perfect inspiration for young readers to begin their own garden. The colorful and friendly illustrations by Rosalind Beardshaw, invite the readers to turn each page as they watch Lola’s garden grow. Lola Plants a Garden is available in both English and in Spanish. Peach Girl introduces Momoko, an ambitious little girl who sets out to make the world a better place! Born from a peach to an elderly couple, Momoko is determined to set out into the world. The couple warns Momoko to be on the lookout for an ogre that has been rumored to eat young children. Momoko goes in search of the feared ogre to see if the rumor has any truth behind it. As she travels away from home she makes friends along the way, a monkey, a dog and a pheasant. As they offer her directions, advice and help, Momoko promises to share her peach dumplings. As they get closer to encountering the ogre, Momoko and her friends become frightened. Together they will go as far as it takes to reveal the truth behind the rumor. The illustrations by Rebecca Bender are bright, exciting and compliment the narrative very well. Plenty of peachy colors assist the light and fun tone. 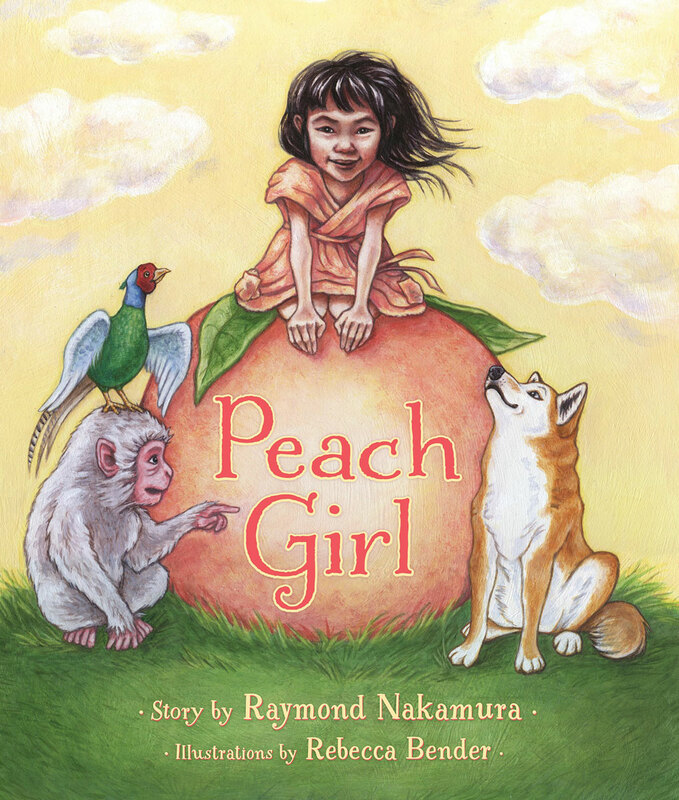 Readers looking for a strong female protagonist will enjoy Momoko’s adventure in Peach Girl. The Ugly Vegetables has become a timeless favorite! As a mother and daughter team begins to prepare their garden for the season, differences of how they plant, plot and prep from their neighbors become apparent. As they garden grows throughout the season, the neighbors gardens pop with color as flowers blossom but their own garden has ugly bumpy vegetables. Though their garden of Chinese vegetables is not beautiful to look at, the end of season result is delicious! If you don’t believe me, try the recipe for yourself! 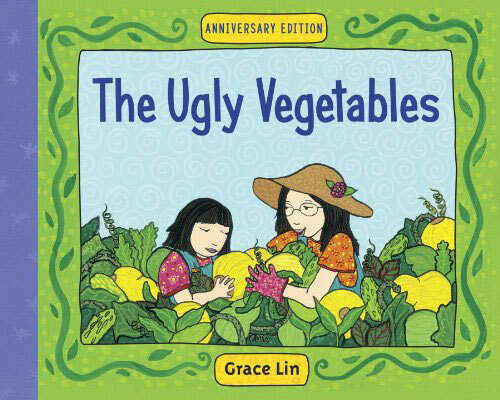 Learn all the Chinese vegetables featured throughout the story in a colorfully illustrated glossary at the end of the book. The Ugly Vegetables celebrates differences and highlights the positive aspects community, gardening and food! Grace Lin eloquently brings everyone together despite any differences with her simple narrative, colorful illustrations and family recipes.